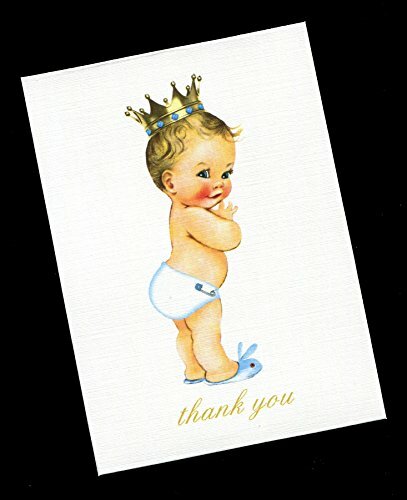 These thank you cards are perfect for your baby shower guests. They feature a cute baby boy in a white diaper with a gold crown. They are blank inside for your message. The cards are 4 7/8" tall and 3 1/2" wide. They are printed on linen cover stock on a laser printer. You will receive 20 cards and 20 white envelopes. Designed by Susie Dee's with licensed graphics. If you have any questions about this product by Susie Dee's, contact us by completing and submitting the form below. If you are looking for a specif part number, please include it with your message.